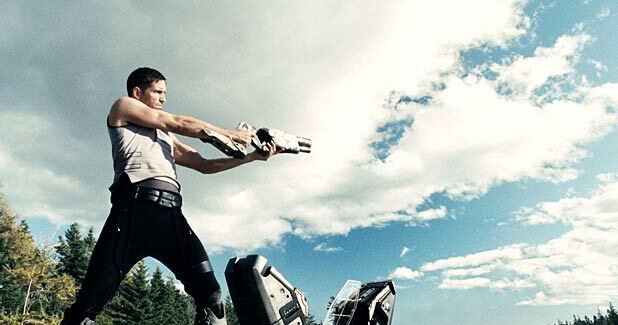 The latest (if not the only) entry in the oft-neglected Viking/alien crossover subgenre is about space pilot Kainan (Jim Caviezel) who crash lands on earth circa 709AD and finds he’s not alone. A strange and terrifying monster escapes and attacks the local Norse population. It’s up to Caviezel to join forces with the indigenous warriors to kill this powerful and ravenous starbeast. This is flashy nonsense, a rough and ready mix of Beowulf and Predator; there’s no attempt at realism, just a clichéd Viking life of brawling, feasting and drinking mead. History only gets in the way of flamboyant set pieces. The Moorwen itself is nicely designed, while they try and crowbar in an environmental message about extinction and man’s responsibility for the animals of planet earth. But for the majority of the run time it’s simply sweaty axe-wielding men fighting bears, aliens or each other. Unfortunately it drags in places, the climatic confrontation in particular is over long and the final act feels superfluous and some swift editing would have left a sharper more dynamic piece. Fun, but instantly forgettable. General release from Fri 24 Apr.